It is a Disney film not made by Pixar, it is based on the standard schtick of talking animals that Dreamworks has made a business out of, the plot and the setting are highly derivative of better work, and it isn't animation masterclass at any point. Yet, Disney's Bolt is one of the most fun, interesting and genuinely entertaining animated films outside of the Pixar oeuvre. The film is wittily written and has clever dialogue, the characters crackle with energy, due in parts both to the crisp animation and the great voice acting, and the themes as well as humour are better produced than anything else in the cinemas right now. In fact, the funny quotient may come from the vivid animation and some slapstick here and there, but largely the film depends on the smart script that appeals to the adults a lot. The story follows Bolt (John Travolta), a TV star dog whose show is about him having superpowers and saving his owner Penny (Miley Cyrus) every episode. Bolt doesn't realize that the show is fiction, and that all the stunts and amazing things he does are all theatrical. The TV guys do their best to maintain that fiction for Bolt, lest he be disturbed. 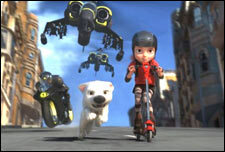 In an episode where Penny is kidnapped by evil scheming villains, Bolt freaks out, and escapes the studio lot to the real world, where adventure in the form of real life awaits him. Along the way, he picks up a reluctant comrade-in-arms in the form of a cat named Mittens (Susie Essman), who had been running a successful protection racket for pigeons in New York, and who Bolt believes is an evil cat from the show. Also along is Rhino (Mark Walton), a crazy, TV obsessed hamster who lives in a plastic shell and completely worships Bolt. Bolt has to realize the harshness of the world, and the reality of his existence and that of his owner, with his friends along the way. The film is quite entertaining in its own right, but the light thematic touches do add up in making it a great movie. The voice acting is another reason it shines - while Travolta and Cyrus are both aces in their voice-acting, it is the relative unknowns that are the best thing about the cast. Both Essman and Walton excel as Mittens and Rhino, and bring life to their colourful characters with surprising ease and affability. They both have different jobs to do - Essman's Mittens is not the emotional core of the film, but she is the main catalyst, and her darker, more somber mood is just the right touch to the vividness of the film. Walton's Rhino is just supposed to bring the funny. Despite over-saturation of his best parts in trailers and such, he is a laugh-a-minute character whose unfailing optimism is often the source of the biggest guffaws in the movie. The film looks fantastic, too - I saw it in 3D, and it just added to the overall effect - but even without gimmicks, directors Byron Howard and Chris Williams have created thoroughly entertaining action sequences, and really kinetic set-pieces. So much so that, I found myself thinking how much I'd enjoy watching the fake show that Bolt was a part of as well. It's a neatly handled movie, with nothing overshadowing its fun level. Bolt is not as ambitious as a Pixar film, and neither does it have the sheer emotional scope of any of their adventures, but neither is it as banal as any Dreamworks output. It is a fun, entertaining film with lots of good moments and a great visual language, and sometimes, with the help of great voice-acting and some sharp writing, that is enough to make a movie a must watch. fullhyd.com has 700,000+ monthly visits. Tell Hyderabad what you feel about Bolt!